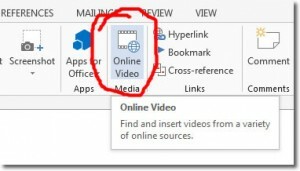 How do you Insert YouTube Videos Into Microsoft Word? And now for our feature presentation! Behold: the ability to insert YouTube videos into Word.Word 2013 has a new command on the Insert tab: Online Video. But it’s not so much the ability to insert videos into a Word document that captures the imagination, as the ability to watch them without leaving Word. I don’t know why this would be a better prospect than actually visiting the video site, but you have that ability, nonetheless. Perhaps the company you work for have some kind of firewall that prevents visits to YouTube etc. Anyway, to insert an online video into Word click Insert > Online Video, and the Insert Video window is displayed. 41 – Microsoft Word Tip: Microsoft Office 2013 Options: Which Version of Microsoft Office Should I Buy?